A few years ago, you�d have been hard-pressed to find a separate digital-to-audio converter, or DAC. Now, once again, the standalone DAC is the hot audio component, with many manufacturers hurrying new designs to market. In addition, many new CD players offer direct inputs to their internal DACs. Why the sudden demand for DACs? As SoundStage! readers, you already know the answer, thanks to publisher Doug Schneider�s January and February 2010 editorials: computer-based music playback -- specifically, using your computer to store, organize, and play digital music files. I believe that computerized music servers are the future -- and, for many, already the present -- of recorded music. Although a computer can store, organize, and play back your music, it still needs an external DAC to convert its output -- a stream of digitally encoded ones and zeros -- into an analog electrical audio signal. Ranging in price from under $100 to well over $15,000, DACs can be very simple or very complex. It seems to me that, to succeed in today�s competitive market, a DAC must be pretty flexible: all things to all people. But some DACs, notably those from Ayre Acoustics and Wavelength, are specialists; they are designed to work only with computers, and have only USB inputs, albeit very good ones. I have long admired Esoteric gear; if not the state of the art, it�s awfully close. Several of their SACD players are split into two sections: a transport (the best in the industry, period) and a DAC. In addition to several standard inputs, Esoteric DACs also decode SACDs. Up to now, the transports and DACs have come in matching pairs: P-01 and D-01, P-03 and D-03, P-05 and D-05 (P denotes the transport, D the DAC). Generally, the lower the model number, the more expensive and, presumably, the better the component. Because Esoteric DACs are part of their SACD playback systems, I had never thought of using them with other sources. 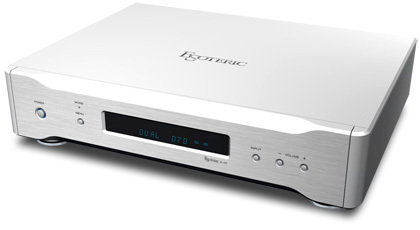 But now, with the DAC business thriving, Esoteric has released the D-07 ($4800 USD). No P-07 transport is planned; if you want a transport, the P-05 is recommended. The D-07 falls into the "all things to all people" category, with many inputs: USB, two S/PDIF, AES/EBU, and optical (TosLink) -- everything but FireWire and I2S. If you plug one of Esoteric�s matching transports into the D-07�s AES/EBU input, it will decode and play its SACD signal. Except for the USB, which supports signals only up to 24 bits/96kHz, all inputs accept signals up to 24/192. Lovers of high-resolution music files should be excited to see that the D-07 supports both SACD and hi-rez PCM files. I was particularly interested in how the D-07 would support my primary music server, a Hewlett-Packard Pavilion DV-9205us laptop computer. Although its manual says the D-07 works only with Windows-based computers, Esoteric says it will work with McIntosh�s operating systems and iTunes as well as with Windows 7. It worked fine with Windows 7, as installed on my laptop. Setup instructions are given for Windows XP and Windows Vista, and Windows Media Player is recommended as the server software. I know of no computer audiophile who wants to use Media Player, which can�t play the popular FLAC format; most prefer some other server software: J. River, Media Monkey, or Foobar2000, which is what I have. I strongly recommend that Esoteric provide detailed setup instructions for these softwares, as do Benchmark and Ayre on their websites. Setting up the DAC and software to work together is perhaps the hardest part of getting a computer-based server to work. Although the D-07 is the first Esoteric DAC to offer a USB input, I was told that Esoteric recommends S/PDIF for higher-resolution data input. The USB connection is not an asynchronous design, so currently popular. However, the D-07 includes a USB isolator that�s said to "isolate the power/signal line from the unit, and prevent external noise interference from other devices such as a PC." The inside of a PC is full of electrical noise; an isolator to shield the DAC from such noise sounded useful. The D-07 has two types of digital filters. Its finite impulse response (FIR) filter has been used very successfully in previous Esoteric products. A new filter, called the short delay digital filter (S_DLY), removes pre-echo from recorded music. This type of filter, which has also been called an apodizing filter, is said to clean up digital artifacts created during the recording process. Bank account permitting, you can add Esoteric�s G-03X Master Clock Generator ($4500) to improve the D-07�s jitter performance by an order of magnitude. If you don�t use an external clock, a second internal phase-locked loop (PLL) circuit still provides additional jitter reduction. The D-07 uses an Asahi Kasei Microdevices Corporation AK4392, a 32-bit chip with processing power to spare. The digital attenuator on the D-07�s analog output allows the DAC to be connected to a power amplifier and the system volume controlled by the D-07. The 32-bit processing means there�s extra headroom before a loss of quality occurs when the volume control discards bits to attenuate the sound. Nothing I�ve seen, except perhaps the �ber-expensive digital gear from dCS, remotely approaches the D-07 for physical beauty. Its sculpted case is drop-dead gorgeous, and its 20.9-pound weight tells you it�s built like the proverbial brick outhouse. The case�s solidity is a means of controlling vibrations -- always anathema to source components. The thick front panel is contoured to match that of the P-05 transport and other Esoteric models. A window in the center of the panel displays the input selected and the data rate received by that input. The top and sides of the case are slabs of aluminum contoured to match the front panel. Available only in silver, the case is 17 3/8"W x 4 3/4"H x 13 5/8"D. Three feet, two in front and one in back, look as if they actually isolate the case from shelf-borne vibration. The D-07 is strictly a two-channel processor. Its analog audio output is via either balanced XLR jacks or unbalanced RCA jacks. The output impedance of both outputs is 100 ohms, which should drive virtually any cable and preamp. Esoteric found that about 70% of their customers already had an Esoteric remote control, so they wisely elected to make the D-07�s remote optional ($299). If you have another Esoteric remote, it will operate the D-07. Replacing my Benchmark DAC1 Pre with the Esoteric D-07, I hooked up the latter to my laptop two different ways, using 1) the USB connection via a Wireworld Starlight USB cable; and 2) the S/PDIF input with an M2Tech hiFace USB-to-S/PDIF converter. A Wireworld Gold Starlight 6 coaxial S/PDIF cable connected the hiFace to the DAC. For both types of connections, the DAC was connected to my preamp via 4m-long, unbalanced Audience Au24 e cables. (I had no 4m balanced cables.) Although the D-07�s supplied power cord looks unusually robust, I used a Blue Marble Audio Blue Lightning cord instead, which has proven to enhance the sound of most components I�ve used it with. I broke in the D-07 for 300 hours on the unbalanced outputs with both S/PDIF and USB inputs. As soon as I inserted the D-07 in my system, it installed drivers automatically. When I started the Foobar2000 server software and went to Preferences to select a new output, there were several new output choices labeled "Esoteric D-07," and many labeled "S/PDIF." Oddly enough, there was no setting for 88.2kHz playback. My Benchmark DAC played 88.2kHz files just fine, but when I fired up Foobar2000 and sent an 88.2kHz file to the D-07 using the foo-WASAPI.dll player, an error message appeared telling me it didn�t support that frequency. I also tried MediaMonkey, another fine server program. MediaMonkey did play 88.2kHz files, but only after converting them to 96kHz files. Esoteric researched the problem, and discovered that indeed the USB input didn�t support 88.2kHz files as claimed, but upsampled them, as I had already observed. I have several 88.2kHz albums in my collection, so I was disappointed that I couldn�t play them, at least without upsampling them to 96kHz. Setting up a DAC involves more than just connecting it to your system. Most DACs offer the user several choices -- filters, upsampling rates, and perhaps other features unique to the particular DAC. The D-07 offered four choices of upsampling: none, twice the basic sampling rate, four times that rate, and upsampling to the DSD rate used by the SACD format (2.88MHz). There are no absolutely correct choices; my preferences may not appeal to you. However, with 44.1kHz files (CD equivalent), I found the 4x upsampling rate gave the best sound to my ear: more spacious and full than the rest. The DSD sampling rate lost detail and rounded off the transients. For 88.2 and 96kHz files, I used the 2x upsampling rate. When the input sampling rate is 176.4 or 192, the D-07 will convert these to the DSD format if you wish. Whether to use the finite impulse response (FIR) or the short-delay apodizing (S_DLY) filter proved a subtler choice; I liked the short-delay filter better because it seemed to produce the more natural sound. You may favor the FIR setting. In a word, the sound via the D-07�s USB input was energetic: lively and bouncy. This characteristic included PRAT (pace, rhythm, acceleration, timing) as well as dynamics. The music seemed itching to move forward -- it didn�t sound rushed or artificially juiced up, but everything played at precisely the right time, without dragging or losing momentum. While not overemphasized, transients were sharp and clear. On J.S. Bach�s Concerto for Four Harpsichords, from J.S. Bach: Transcriptions of Italian Music, by the American Bach Soloists (16/44.1 WAV, Magnatune), the music fairly burst with vitality, and the D-07 made it clear that there really were four harpsichords being played; on some recordings, they sound like a single instrument. But through the D-07, each harpsichord was distinct; I could even distinguish the instruments� different tonal characteristics. Sometimes, a component with an extremely energetic sound sacrifices detail. Not so the D-07, which presented abundant detail as a natural part of the musical structure. Unlike some components, the D-07 didn�t goose its high frequencies to achieve an impression of detail. The D-07�s detail included the complete dynamic range, from tiny microdynamic changes a solo musician uses to subtly phrase the music to the huge crashes of a full symphony orchestra in full cry. Want to hear a spectacular soundstage? Play a high-resolution digital music file. The spatial aspects of a hi-rez recording such as Ars Antiqua Austria�s Music and Dance from the Viennese Court (24/96 FLAC, Chesky/HDtracks) were generally very well defined, but in a natural rather than a hi-fi way. And to this former recorder player, the recorders in this recording sounded extraordinarily realistic -- tonally complete, with accurate attack and release of notes. Although the D-07 covered the complete audioband and then some, it didn�t emphasize any particular part of the range. If you�re looking for a skewed frequency range to balance your system�s deficiencies, the D-07 won�t appeal; but if your system is already well balanced, the Esoteric will fit it like a glove. The D-07 didn�t sacrifice bass detail in favor of depth and power -- it provided them all in full measure. My H-P laptop doesn�t have a coaxial S/PDIF output, so I had to use a converter. The M2Tech hiFace USB-to-S/PDIF interface uses the now-ubiquitous USB 2.0 protocol to convert a USB output to S/PDIF. And because the hiFace uses USB 2.0 chips, it had no trouble at all reproducing 88.2, 96, 176.4, and 192kHz files. I had to install a set of drivers from a disc, which was trivially easy. Once that was done, I selected the hiFace USB-to-S/PDIF converter as the output device in Foobar2000 and was immediately rewarded with the sight of "RCA1 192" on the D-07�s front-panel display, telling me it was ready to play 192kHz files via the first S/PDIF input. The first file I played was Chesky�s reissue of Rebecca Pigeon�s The Raven (24/88.2 FLAC, Chesky/HDtracks), which I couldn�t do via the USB input. This recording has a relaxed purity that makes the "Red Book" CD sound somewhat grainy, in the sense that some photos are grainy. The natural clarity of Pigeon�s voice was breathtaking. One of the few 24/192 files in my collection is an album of Mozart�s Symphonies 29, 31, 32, 35, and 36, with Sir Charles Mackerras conducting the Scottish Chamber Orchestra (24/192 FLAC, Linn). The strings were ravishingly beautiful: sweet, yet with a slight edge that didn�t let me forget that strings were being pulled across each other. This may be the best orchestral string sound I�ve ever heard. The USB input seemed to have slightly wider frequency extension at both ends of the audioband than the hiFace-S/PDIF combination. On Argento�s For the Angel Israfel, performed by Eiji Oue and the Minnesota Orchestra and ripped from Reference Recordings� 30th Anniversary Sampler (CD, Reference RR-908), the delicate chimes that open and close the piece rang out stronger, with more definition and greater high-frequency extension. The bass drums, which are whacked pretty hard toward the end of this work, seemed to extend lower in frequency than via the hiFace-S/PDIF connection, and were better integrated into the soundstage. The USB input also had more vivid dynamics, and sounded more spacious and open. However, a friend who is an audio dealer and a very experienced listener disagreed, finding the USB input too "Technicolored" and less musical. But to me, the USB input sounded slightly but perceptibly better than the hiFace-S/PDIF. My Benchmark DAC1 Pre costs about a third as much as the D-07 but has even more functionality. In addition to a volume control that lets you connect it directly to a power amplifier, the Benchmark has an analog input so you can connect a tuner or phono preamp. Its volume control is analog, so it won�t degrade the sound, no matter how far you throttle back the volume. The Benchmark�s USB input was one of the first that would handle sampling frequencies up to 96kHz, and driven by my preferred server software, Foobar2000, it handled 88.2kHz files just fine. The Benchmark also includes an excellent headphone amplifier. USB input: Although the Benchmark�s USB input plays 88.2kHz files, the D-07�s USB section pretty well trounced it sonically. In comparison, the Benchmark sounded two-dimensional, mechanical, and less realistic -- almost like a caricature of the music. I wasn�t expecting the Benchmark to surpass the D-07, but I didn�t realize how much better a USB input could sound. hiFace-S/PDIF input: The Benchmark performed much better through the hiFace converter connected to its S/PDIF input, but compared to the D-07�s hiFace-S/PDIF input, the Benchmark sounded a bit closed-in and lacked dynamics. I was hoping the Benchmark would prove to be a giant-killer, but no such luck. It�s not junk, but the comparison showed it�s possible to get even better sound. CD player: If I�m to replace my CD player with a computer-based music server, I doggone well expect the server to sound at least as good as the CD player. So I compared the D-07�s best-sounding input, the USB, to my venerable Meridian 508.24. The old Meridian has withstood competition from several excellent review products that may have equaled but never surpassed its sound. To my surprised delight, the sound of my computer-based server playing through the D-07 DAC was essentially equal to the sound of the Meridian. It�s good to know that when I finally give up the Meridian in favor of the computer, I won�t be sacrificing sound quality. Before that happens, I need to rip about 1800 CDs to my hard drive. SACD player: If a music server becomes my hi-rez digital source, its sound should match or exceed that of my Sony SCD-XA5400ES. To compare the Sony to the D-07 with my music server, I used the same recording: pianist Jon Nakamatsu and the Rochester Philharmonic Orchestra, with Jeff Tyzik conducting, in Gershwin�s Piano Concerto in F, Rhapsody in Blue, and Cuban Overture (24/88.2 FLAC, Harmonia Mundi/HDtracks); and the same recording from SACD (Harmonia Mundi SACDHMU 807441). Through the hiFace-S/PDIF input (which I had to use to get the D-07 to play an 88.2kHz file in its native frequency), the D-07 produced a vibrant, powerful, exuberant sound, with tons of detail and vivid tonal color across the entire audioband, and powerful, weighty bass. This is one of the best recordings of a symphony orchestra I�ve heard. Through the Sony, the bass was similar: powerful, detailed, and weighty, but the sound worsened as it rose through the audioband, upper-midrange and treble frequencies sounding murky and recessed. A friend who sat in on this listening session commented that the performance sounded like a different recording through the Sony, and he was right. In this case, the Esoteric D-07 DAC pretty well trounced the Sony SACD player. It�s an exciting time to be an audiophile, and to participate in the development of the computer music server and its assimilation into audio systems. Right now, it�s possible to get excellent sound from a computer server, but it may require that you invest a lot of time and effort, and possibly money. That will change, but not overnight. The Esoteric D-07 can be a part of an excellent computer music server, or a standalone server that uses S/PDIF or AES/EBU outputs. It sounded superb through both its USB and S/PDIF inputs. Although the former sounded slightly better in my system, my test was not conclusive, as I had to use the hiFace converter to get a S/PDIF output from my computer. If you want your computer-based server to play hi-rez music recorded at all commercially available sampling rates, the D-07�s inability to play 88.2kHz files in their native format through its USB input rules it out. But if you don�t need to play 88.2kHz files, the D-07 could be just the ticket. And even if you do want to play 88.2kHz files natively, there are many other USB-to-S/PDIF converters, such as Empirical Audio�s Off-Ramp 3, that might sound better than the hiFace. Most of these don�t play sampling rates higher than 96kHz, though, and most cost way more than the hiFace�s $150. DACs are evolving rapidly, but many DACs in the D-07�s price range still offer no USB inputs, only S/PDIF coaxial, S/PDIF optical, or TosLink and AES/EBU connections. I can unequivocally state that the sound of the Esoteric D-07 DAC is very elegant and refined, and its appearance is stunning; if you�re shopping for a DAC for somewhere in the vicinity of $5000, the Esoteric D-07 is definitely worth auditioning. Warranty: Three years parts and labor with registration.